Aka Malcolm Torrie, Stephen Hockaby. Born in Cowley, Oxford, in 1901, Gladys Maude Winifred Mitchell was the daughter of market gardener James Mitchell, and his wife, Annie. She was educated at Rothschild School, Brentford and Green School, Isleworth, before attending Goldsmiths College and University College, London from 1919-1921. She taught English, history and games at St Paul's School, Brentford, from 1921-26, and at St Anne's Senior Girls School, Ealing until 1939. She earned an external diploma in European history from University College in 1926, beginning to write her novels at this point. Mitchell went on to teach at a number of other schools, including the Brentford Senior Girls School (1941-50), and the Matthew Arnold School, Stai Aka Malcolm Torrie, Stephen Hockaby. She earned an external diploma in European history from University College in 1926, beginning to write her novels at this point. Mitchell went on to teach at a number of other schools, including the Brentford Senior Girls School (1941-50), and the Matthew Arnold School, Staines (1953-61). She retired to Corfe Mullen, Dorset in 1961, where she lived until her death in 1983. 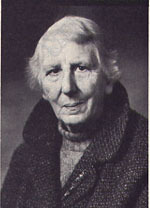 Although primarily remembered for her mystery novels, and for her detective creation, Mrs. Bradley, who featured in 66 of her novels, Mitchell also published ten children's books under her own name, historical fiction under the pseudonym Stephen Hockaby, and more detective fiction under the pseudonym Malcolm Torrie. She also wrote a great many short stories, all of which were first published in the Evening Standard. “Look here, Mrs. Bradley," he said. "I feel a pretty frightful bounder telling you all this about the poor girl, but I think some woman ought to know about it. On Wednesday night, yes, last night, Eleanor came into my bedroom at about half-past twelve and--and wanted to stay there! I thought it was a ghost at first. I had terrible difficulty in getting rid of her. In fact, I had to get out of bed and shove her outside and lock the door. Choice, isn't it?" "Of course you will lock your door tonight," she said.